Initial work to form the agency began as early as 1975 by a group of concerned citizens who recognized the magnitude of the problem of child abuse. Formerly known as Committee For Kids, Inc., The Family Nurturing Center began as “Citizens Committee Against Child Abuse and Neglect of Northern Kentucky” in 1988. The first program, Parents Anonymous, was held in September 1978 and the agency incorporated in 1979. Family Nurturing Center became a United Way Member Agency in 1988 and later became an affiliate of Family Nurturing Center, National. Today, the agency is the largest affiliate of Prevent Child Abuse Kentucky and recipient of the Kentucky Child Victim’s Trust Fund. Family Nurturing Center is governed by a volunteer Board of Directors. The Board employs a full-time Executive Director who hires talented and dedicated staff to carry out the vision and philosophy of the agency. Direct service programs are offered at our Florence location as well as at donated sites across Northern Kentucky. The majority of services are provided to residents of Boone, Campbell, Grant and Kenton counties in Kentucky, and Hamilton County in Ohio, although there are no geographic restrictions. Strong community support and the spirit of volunteerism allow us to provide quality programs in cost effective manner. Family Nurturing Center is a charitable 501c3 not-for-profit organization. All Family Nurturing Center employees require a shared vision and philosophy that promotes and enhances the agency mission, the ability to handle sensitive information and maintain a high level of confidentiality, demonstrate cultural competence and incorporate a trauma informed care philosophy. All of our programs are abased on the foundations of the Nurturing Parenting philosophy and Trauma Informed Care. Family Nurturing Center holds the values of treating individuals with respect and dignity, using evidence based programs or promising practices, showing measurable improvement and a commitment to continues learning across programs and services. These are our core beliefs. Family Nurturing Center offers more than a place to work. We provide a place for people to put their passion to work – to make a difference in the lives of others, and to build not only a stronger organization, but also a stronger community. Annually our agency recognizes employees for the Nurturer of the Year award. Recipients are nominated by staff and selected by an independent committee of board members, volunteers and staff. They are chosen because of their outstanding work and demonstrated characteristics of: Living the Mission; Impact; Nurturing; Change Agent; Leadership; Culture; and Trauma Informed. 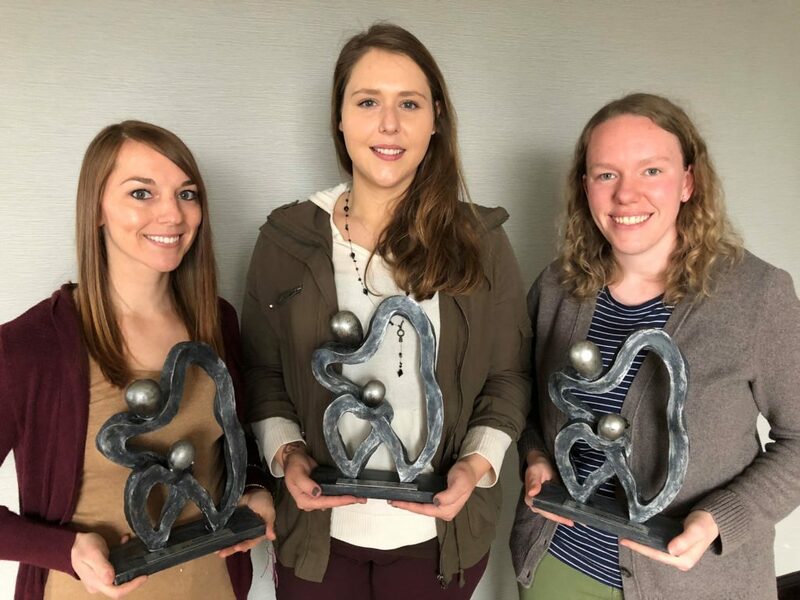 Congratulations to our 2018 Employees of the Year: Kristie Kelly, Autumn Caldwell and Erika Salter.